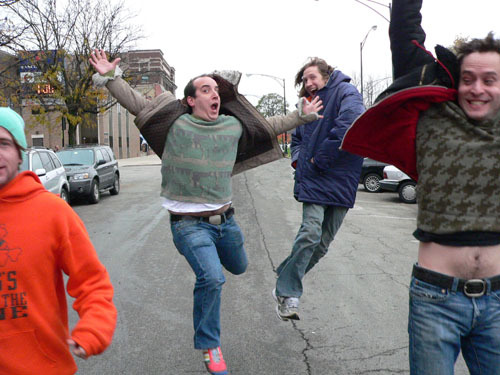 AL: What is going on in the Sean Na Na / Har Mar Superstar world? AL: Har Mar is still alive and well? like the Superman 3 soundtrack. I have moved on. while. How did that happen? America. I was just following where the action was. I did a tour with The Pattern. were there, and then next week pictures were everywhere. It blew up from there. AL: What do The Pattern do now? opening parties at Noise Pop a few times. It was a party vibe. AL: Do you like to provoke people in the audience? over-reacting, there is under-reacting. You have to go for it. AL: Sean Na Na is more like a band? gets rowdy and has a good time. AL: So it’s more like Guided By Voices? AL: Do you have a tub of alcohol right there onstage? AL: Are there actual members of Sean Na Na? ars, bass, keyboards, and drums. AL: Did you pick up where the last Sean Na Na record left off? fell into place. It wasn’t too much of a shock. AL: What was it like working with Greg Dulli? Sean: He’s awesome. We were having fun. It was casual. He came in for a day. was lending a helping hand. AL: Was it like acting with Deniro? bigwigs and can get into all the clubs? Sean: I don’t know how to respond to that. Karen O play on this record under a pseudonym? AL: How did you go about recording these songs? recorded some in Portland. It was mixed in New York. AL: Is it hard to be in the Midwest and be a band? AL: What are the songs about on this album? Sean: Whatever came to mind. I didn’t feel like I had any issues to tackle. that goes through the album. AL: What is the song “The Hunter” about? Sean: It is about hard living and not getting tied down. AL: Should we legalize marijuana and prostitution? AL: You have spent much time in Amsterdam? AL: Are you touring soon? People want to hear these songs! play. We want them all to be awesome shows. AL: Are you going to play old Sean Na Na songs? AL: What about if someone yells out for some Har Mar Superstar songs? separate entities. We don’t like to cross the stream. Sean: That was awesome. Those guys are old friends of ours from Minneapolis. a lot of older guys in their 40s. Sean: All those crazy girls. AL: What about Fab Moretti? AL: What is going on with the Strokes? own songs. I heard some and they are great. Sean: Yeah. They are one of my favorite bands. AL: Do you like any other new bands? the record store and can’t remember what I came there to buy. AL: You have been living in LA for a while? moving any time soon. I bought a place here and I like it. AL: I see this guy Preston at a lot of your shows. What does he do? Sean: He has been doing some acting. He is a music fan. Sean: Yes. I like Klaxons. AL: What was that second band? Sean: I just said Klaxons. I was thinking out loud. kids out there that you have to send monthly checks out to? Sean: If I do have any kids, I am not aware of them. after party. But I don’t do that very often anymore. AL: What part of the world do you want to go back to? Red Hot Chili Peppers. That was my fourth time over there. AL: Those must have been big shows? Did Tony go over there with you? AL: What was the reaction like? upset that they don’t have an Australian band open for them. AL: Are there any books that you like? Motherless Brooklyn. He has a new one out about a rock band. AL: Do you get a lot of messages on Myspace?